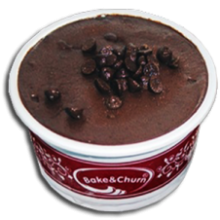 Bake & Churn Black Forest Bar is another variation of the beloved ice cream flavor. 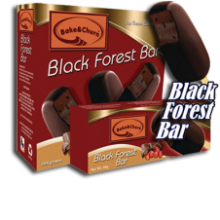 Rich and creamy black forest ice cream on a stick is coated in two layers of milk chocolate for the ultimate in indulgence. Shipping Delivery:​ Metro Manila and Selected Areas Delivery Only. Please Note: Place order at least TWO (2 to 3) days Lead Time prior to delivery date. Cut-off time at 1:00 PM Philippine Standard Time. Your purchase includes a complimentary personalized gift card. 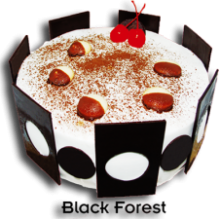 Black Forest Dome by Bake & Churn Size: 8" Shape: Round. 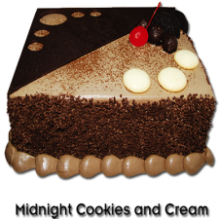 Cake Layer: Moist Chocolate. Ice Cream Layer: Black Forest. Filling: Cherry Filling. Frosting: Whipped Cream. Toppings: Chocolate Bars, Cherries Cocoa Powder, and Cookies. Shipping Delivery:​ Metro Manila and Selected Areas Delivery Only. 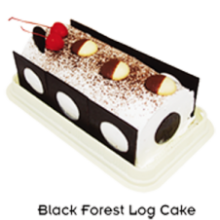 Black Forest Premium Log by Bake & Churn Size: 7" x 4" x 4" Shape: Rectangular. Cake Layer: Choccolate Fudge. Ice Cream Layer: Chocolate. Fillings: Cherries. Toppings: Chocolate Blocks, Whipped Cream, Cherries, Cookies, and Cocoa Powder. Shipping Delivery:​ Metro Manila and Selected Areas Delivery Only. 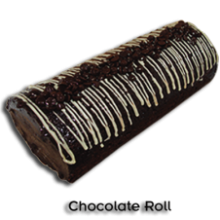 Chocolate Classic Log by Bake & Churn Size: 7.5 Diameter. 4" Log. Shape: Log. Cake Layer: Chocolate Sponge. Ice Cream Layer: Chocolate. Toppings: Chocolate Frosting, Chocolate Droplets, and Mocha Syrup. Shipping Delivery:​ Metro Manila and Selected Areas Delivery Only. Please Note: Place order at least TWO (2 to 3) days Lead Time prior to delivery date. Cut-off time at 1:00 PM Philippine Standard Time. Your purchase includes a complimentary personalized gift card. 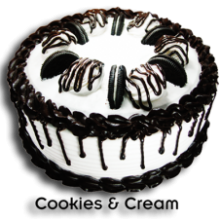 Cookies And Cream Dome by Bake & Churn Size: 8" Shape: Round. Cake Layer: Moist Chocolate. Ice Cream Layer: Cookies & Cream. Filling: Chocolate Syrup. Frosting: Whipped Cream. Toppings: Whipped Cream, Chocolate Syrup, and Oreo Cookies. 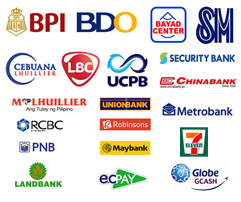 Shipping Delivery:​ Metro Manila and Selected Areas Delivery Only. Please Note: Place order at least TWO (2 to 3) days Lead Time prior to delivery date. Cut-off time at 1:00 PM Philippine Standard Time. Your purchase includes a complimentary personalized gift card. Mango Madness Dome by Bake & Churn Size: 8" Shape: Round. Cake Layer: Vanilla Sponge. and Sans Rival Wafer. Ice Cream Layer: Mango. Filling: Mango Jam and Cashew. 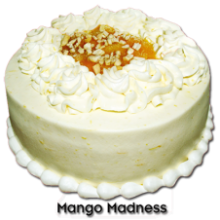 Frosting: Mango Cream. Toppings: Whipped Cream, Mango Jam and Cashew. Shipping Delivery:​ Metro Manila and Selected Areas Delivery Only. Please Note: Place order at least TWO (2 to 3) days Lead Time prior to delivery date. Cut-off time at 1:00 PM Philippine Standard Time. Your purchase includes a complimentary personalized gift card. 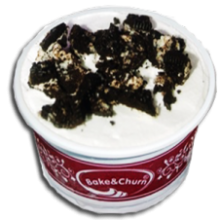 Midnight Cookies & Cream by Bake & Churn Size: 8" x 11" Shape: Rectangle. Cake Layer: Moist Chocolate. Ice Cream Layer: Midnight (chocolate-based) Cookies & Cream. Filling: Chocolate Ganache. Frosting: Chocolate Cream. Toppings: Chocolate Sprinkles, Chocolate Bars, Cookies, Chocolate Truffles and Cherries. Shipping Delivery:​ Metro Manila and Selected Areas Delivery Only. Please Note: Place order at least TWO (2 to 3) days Lead Time prior to delivery date. Cut-off time at 1:00 PM Philippine Standard Time. Your purchase includes a complimentary personalized gift card. 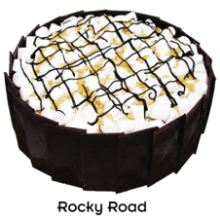 Rocky Road by Bake & Churn Rocky Road Shipping Delivery:​ Metro Manila and Selected Areas Delivery Only. Please Note: Place order at least TWO (2 to 3) days Lead Time prior to delivery date. Cut-off time at 1:00 PM Philippine Standard Time. Your purchase includes a complimentary personalized gift card. 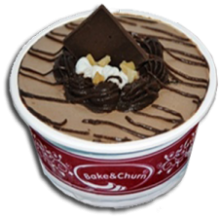 Rocky Road Dome by Bake & Churn Size: 8" Shape: Round. Cake Layer: Chocolate Sponge. Ice Cream Layer: Rocky Road. Filling: Chocolate Ganache. Frosting: Chocolate Cream. Toppings: Chocolate Bars, Nuts, Marshmallows, and Chocolate Syrup. Shipping Delivery:​ Metro Manila and Selected Areas Delivery Only. Please Note: Place order at least TWO (2 to 3) days Lead Time prior to delivery date. Cut-off time at 1:00 PM Philippine Standard Time. Your purchase includes a complimentary personalized gift card. 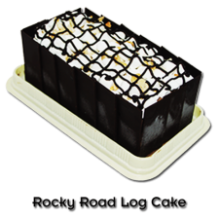 Rocky Road Log by Bake & Churn Size: 7" x 4" x 4" Shape: Rectangular. Cake Layer: Choccolate Fudge. Ice Cream Layer: Chocolate. Toppings: Chocolate Blocks, Chocolate Cream, Marshmallows, Peanuts, and Chocoalate Syrup. Shipping Delivery:​ Metro Manila and Selected Areas Delivery Only. Please Note: Place order at least TWO (2 to 3) days Lead Time prior to delivery date. Cut-off time at 1:00 PM Philippine Standard Time. Your purchase includes a complimentary personalized gift card. 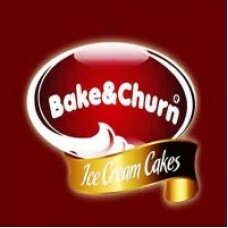 Strawberry Cheesecake by Bake & Churn Size: 7" x 4" x 4" Shape: Rectangular. Cake Layer: Vanilla Sponge. Ice Cream Layer: Strawberry. Toppings: White Chocolate Tulips, Strawberry Whipped Cream, Cherries, and Chocolate Syrup. Shipping Delivery:​ Metro Manila and Selected Areas Delivery Only. Please Note: Place order at least TWO (2 to 3) days Lead Time prior to delivery date. Cut-off time at 1:00 PM Philippine Standard Time. 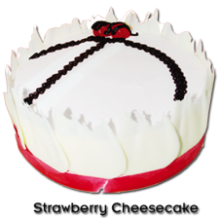 Strawberry Cheesecake Dome by Bake & Churn Size: 8" Shape: Round Cake Layer: Cheesecake. 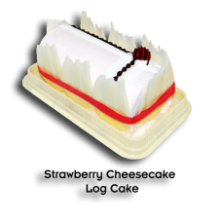 Ice Cream Layer: Strawberry. Filling: Strawberry Jam. Frosting: Strawberry Cream Toppings: White Chocolate and Cherries. Shipping Delivery:​ Metro Manila and Selected Areas Delivery Only. Please Note: Place order at least TWO (2 to 3) days Lead Time prior to delivery date. Cut-off time at 1:00 PM Philippine Standard Time. Your purchase includes a complimentary personalized gift card. 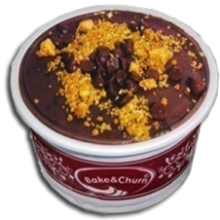 Ube Classic Dome by Bake & Churn Size: 8" Shape: Round. 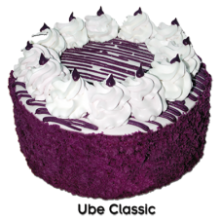 Cake Layer: Ube Sponge. Ice Cream Layer: Ube. Filling: Ube Jam. Frosting: Ube Cream. Toppings: Whipped Cream, Ube Cake Crumbs, and Ube Jam. Shipping Delivery:​ Metro Manila and Selected Areas Delivery Only. Please Note: Place order at least TWO (2 to 3) days Lead Time prior to delivery date. Cut-off time at 1:00 PM Philippine Standard Time. Your purchase includes a complimentary personalized gift card. 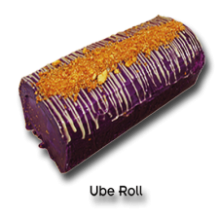 Ube Classic Log by Bake & Churn Size: 7.5 Diameter. 4" Log Shape: Log Cake Layer: Ube Sponge. Ice Cream Layer: Ube Ice Cream. Toppings: Ube Whipped Cream, Toffee Crunch, and Caramel Syrup. Shipping Delivery:​ Metro Manila and Selected Areas Delivery Only. Please Note: Place order at least TWO (2 to 3) days Lead Time prior to delivery date. Cut-off time at 1:00 PM Philippine Standard Time. Your purchase includes a complimentary personalized gift card.